Recently, the baby parrots had their first introduction to children. This was going to be a big new experience. There were four children who were very excited to meet the parrots. There were also three adults (including myself) to make sure the situation was safe for everyone involved. Because this introduction was also occurring in yet another new environment, the baby parrots were going to have to adjust to two criteria at once. This is usually not an ideal training situation. Usually it is advised to focus on one criterion at a time. To help make the transition easier, the first goal was to have the children sit patiently and quietly on the couches while Beni and Wrigley took a look at the new environment. The kids did great! Wrigley came out first and was definitely a bit distracted by the super tall ceiling, high paned windows and open space. Our host’s house has a two story living room. Wrigley needed a few moments to look around. But once he relaxed he flew calmly over to the oldest child, Jay and decided his head was perfect for perching. Jay responded in the best way possible. He held still and kept calm. Wrigley stepped from Jay’s head to my hand with ease, and we were all impressed with Jay’s reaction. Beni came out and quickly relaxed in the new environment. He was ready to fly to his perches and to me right away. Both birds were receptive to treats, and the children asked if they might hold a parrot. Because both birds appeared relaxed we thought we would give it a try. After some instructions for the children, Wrigley stepped onto their arms. Beni tried to fly to one child’s outstretched arm. But we decided a macaw might be a bit too heavy for these youngsters. Instead Beni found his way to my friend Rebecca’s arm a few times. After a while the birds began a few more exploratory flights. Wrigley even ended up on the ceiling fan, but flew down within just a few minutes. This was an important experience for him. In the future he may be in other rooms with high places to perch. I wanted to be sure he had some opportunity to recall from much higher perches than those he had experienced in the past. Lessons I learned from the experience are that we need to explore some more diverse environments. I have some ideas for the next venues to address that. I also think I will have one parrot out at a time if my attention will be directed elsewhere. When working with the children and Wrigley, Beni wanted to fly to me. Normally I step aside when he flies before he is cued and he will land on a perch. I then cue him to fly to me so he can learn a cue is required for permission to launch to me. However because I was focused on an important task with another parrot and child, I had set it up so that Beni could easily land on my head or shoulder. This is a behavior I would prefer he not do. But I had not set either of us up for success in that particular moment. However as mentioned, that can be easily addressed in the future by making sure I will be able to give him my full attention next time. Another piece learned from this excursion is it's time to start training some specific behaviors, flight patterns and/or routines for these guys. This will help give them direction and focus when they are in front of a group of people. Time to brainstorm! *Special thanks to Rebecca for the pictures and to Jenny and all the young bird trainers! Teaching Parrots to Like New People and Places - Making Progress! Beni and Wrigley are progressing nicely. To keep things moving forward we traveled to another new environment. Travel in the crate would be a bit longer this time as our destination was about 20 miles away. My friend Heather is an animal lover and also manages a hotel. She was happy to have us visit. I had a feeling based on our last excursion that the baby parrots would do fine. So I came prepared to videotape their reaction to the new environment. As the video shows, to them it was just another fun place to be. There were no flights in which the parrots seemed confused or unsure of where to go. They simply headed to their perches, to me or Heather, however Beni did discover that the luggage cart was quite fun. He ended up sliding down the sides like a fireman. Who knew enrichment was so easy? Both parrots responded well to Heather. One factor that could have been a distraction for them was that Heather was wearing dark nail polish. I have not worn nail polish around the parrots, so this would be a new experience. I had Heather offer a few treats slowly at first. Fortunately neither parrot reacted to the nail polish. They did however really want to work on the buttons on Heather’s shirt. A few treats, toys and head scratches for staying on the hand or a perch seemed to get their minds off of buttons. As in our past excursions, both parrots started playing with toys. Beni sat calmly while I put the harness on him. And both parrots were recalling like champs in the new space. After about 45 minutes of training and fun, Wrigley starting grinding his beak as if he was ready to take a little snooze. I decided it was time to return to the crate. As usual Wrigley was a dream. Beni hesitated, but went in. Back at home they both went in and out of the crates freely for goodies and toys before they returned to their cages for an afternoon nap. Our next goal is to find a larger space and add a few more people to the mix. This Parrot is Gonna Be a Talker! Wrigley the double yellow headed amazon was quite entertaining last night. He is certainly starting to stretch his vocal abilities. He is mostly just producing sounds at this point, but every once in a while says "good bird", "hi", "hello" and does a little aria. He seems to be trying to copy the sounds my yellow naped amazon Delbert makes...including "Hi Delbert!" I just had to share a video clip as I find it fascinating watching him develop his vocabulary....and he is pretty cute too. It was another big day for the baby parrots. I packed two familiar perches, toys, treats, my dog and the babies into the car for another excursion. This meant a little more time in crates for each parrot. Beni the blue throated macaw still has some hesitation on occasion with the crate, so we practice entering the kennel daily. However he did pretty well with the experience today. I do think he is becoming more accustomed to it. Wrigley the double yellow headed Amazon on the other hand seems to find crate travel akin to luxury cruising I think. He loves it! It is definitely a solid behavior for him. My dog Waylon came along because our destination included fun doggie times too. We were off to my friend Sue’s house. 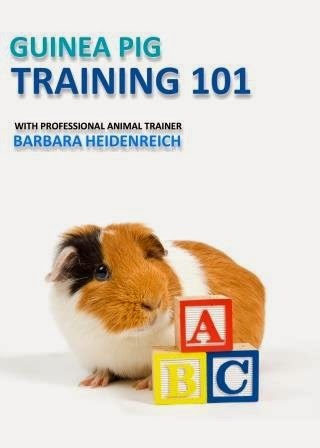 She is a dog trainer who runs a website called Raising Canine. 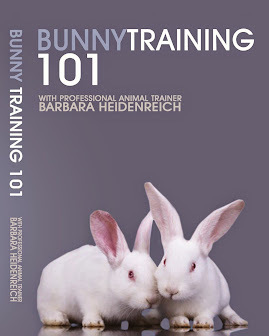 Her site offers instructional courses for professional animal trainers. Her dog Jimmy Jo and Waylon are buddies. 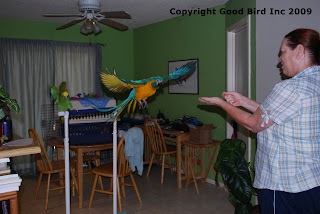 Sue is new to parrots so this was going to be a fun learning opportunity for the babies and for Sue. I was extremely happy to see the baby parrots show absolutely no hesitation when they emerged from the kennels. Their body language showed they were at ease with the new environment. Each flew around the room a few times, but found their perches rather quickly and was ready to present behaviors. After snacking on a few treats from Sue, they were ready to fly to her. This quickly turned into the baby parrots wanting to be on Sue all the time. She’s fun! She’s a treat dispenser! Beni is quite fond of head scratches in addition to treats. I wanted to see if he would be open to a new person touching him. To transition to this, I started giving Beni a few head scratches. Sue slowly took over. Pretty soon Beni was all but melted on the perch soaking up some all over touching. Beni later let me put his harness on and also spent a chunk of his time playing with toys alongside Wrigley on top of a crate. Their next test was to see how they would respond to a new dog, Jimmy Jo. Jimmy Jo gets pretty excited around birds as his breed (Springer spaniel) was designed to hunt for birds. Just to be safe we had Jimmy Jo on the leash. He barked a lot but never tried to go after the birds. The baby parrots just sat there with a “what is with this guy?” look on their faces. I can happily report they were pretty much unphased by yet another new dog. Although one did somehow manage to poop on Waylon’s nose. Going back home, meant going back into the crate. I had a feeling this might be tough after having so much fun at Sue’s. But I came prepared. 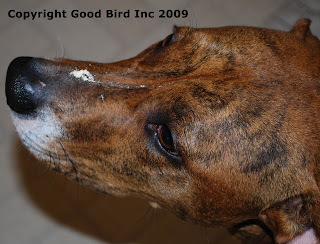 Instead of their usual treats, I brought a nice hunk of birdie bread to use to reinforce going back into the crate. Smart move on my part, if I do say so myself. Wrigley went in perfectly. Beni did pretty well too. They did so well at Sue’s I’d say we are ready for yet another new environment tomorrow! It has been a busy week for me. First I spent five days teaching in Colorado, then I had fun entertaining the VP of the Parrot Society of Australia, and then ……I came down with the flu. But in the middle of all that, my new DVD arrived!! Actually it is a joint project from Robin Shewokis of the Leather Elves and yours truly. Both Robin and I can’t count the number of times we have had an email come across our desks that started with the words “Help! Lost Parrot!” I can sympathize with the anguish the author of that email is experiencing. I once had my parrot fly out a door. I was able to quickly get him back, but for those moments my heart was pounding. Robin and I have long discussed the need for a comprehensive teaching tool to help people get their bird back or prevent the loss of one due to an accidental escape. And finally this summer we were able to film it, as well as collect tons of parrot vocalizations, prepare lost template flyers for over 50 species and put together useful checklists and resources. 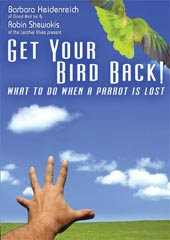 “Get your Bird Back” includes a 27 minute instructional DVD and a separate CD ROM full of additional resources. 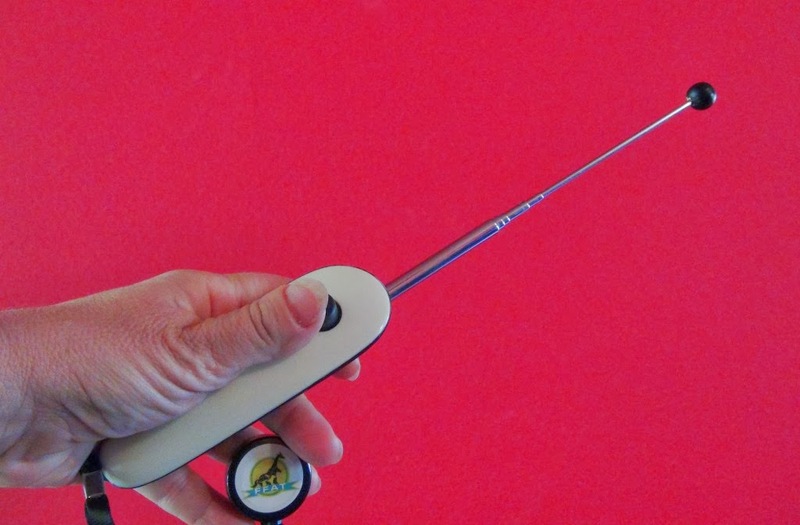 It is designed to help parrot owners should that day come that their parrot escapes. 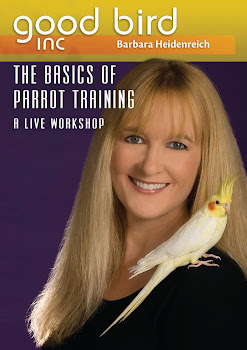 It will also help parrot owners prepare in advance and prevent an escape. 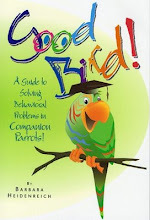 We both hope parrot owners from all over the world can benefit from this resource.